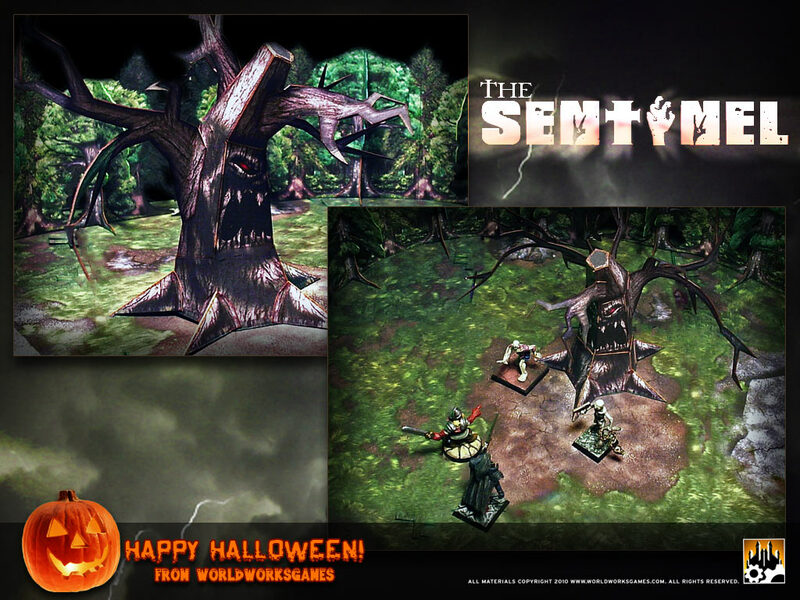 WorldWorksGames • View topic - ****HALLOWEEN FREEBIE**** The SENTINEL! 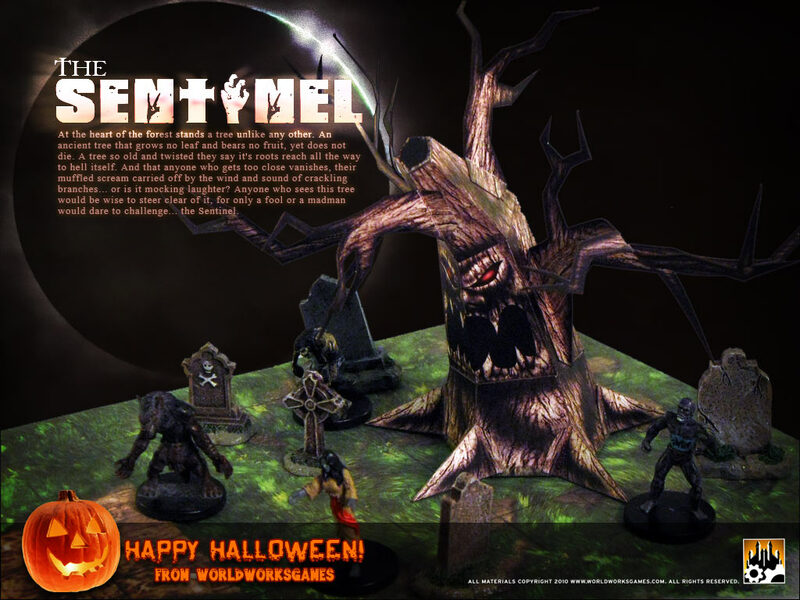 Post subject: ****HALLOWEEN FREEBIE**** The SENTINEL! From the twisted mind of Matt Lyon comes the fantastically fun and COMPLETELY FREE The Sentinel. A WorldWorksGames forum exclusive and our gift to you during our favorite time of the year! Enjoy and have fun this Halloween! At the heart of the forest stands a tree unlike any other. An ancient tree that grows no leaf and bears no fruit, yet does not die. A tree so old and twisted they say it's roots reach all the way to hell itself. And that anyone who gets too close vanishes, their muffled scream carried off by the wind and sound of crackling branches... or is it mocking laughter? Anyone who sees this tree would be wise to steer clear of it, for only a fool or a madman would dare to challenge... the Sentinel. Last edited by Gamesmith Denny on 11-22-2010, 01:55 PM, edited 1 time in total. At the heart of the forest stands a tree unlike any other. An ancient tree that grows no leaf and bears no fruit, yet does not die. A tree so old and twisted they say it's roots reach all the way to hell itself. Cool stuff! Thanks for the freebie - downloaded. This looks really cool! I can't wait until I get home to download this. Thanks! I'm already trying to plan out a way to use this in my Savage Worlds game. Thanks! He looks very menacing. I'd hate to be in his grove. Wow Matt, this is just way too cool!!!! VERY cool! Would work great for Deadlands. The Hanging Tree. "Ellum do grieve, oak he do hate, willow do walk if you travel late." As for Deadlands... I had a PC in the game name Jack Ketch, hangman and, great, great, great grandson of the executioner who once put fruit on Tyburn Tree. Just a quick note I left out of the instructions, if you wanted to go all out with this model and actually cut out the eye and mouth holes you can and the structure should hold up just fine. Just remember to paint the back of the cardstock dark brown or black BEFORE you assemble it. That's a Hell(oween) of a nice freebie! Thanks CapnG and the rest of the WWG bunch! Thanks for this guys, much appreciated. I turned right around and built it! This is going on my Mordheim table. Thank you WWG! I think, with a very small bit of modding, I can make this into a Goblin shaman's house. I knew I wasn't the only one using Lemax Halloween stuff! Well! This is ridiculously cool! For my own part, I Photoshopped out the face so I could build a half dozen or so as the Old Dead Gnarled Forest. One of these days I will get a hold of Wildwood Grove and use THAT dead tree many times over as well. Ooh! heard about this one a few days late, but that's better than not hearing about it at all. Thanks for the great freebie guys! I'm going to have to use this in my weird west campaign! It is really fun to work with this tree, Matt. Using PS, I removed the eyes and then reshaped the mouth into a crevice for a figure to hide in ... blacked the inside. However if it storms its one heck of a 'widow maker'. Nice risk factor I think. Yay! Thanks! This'll go great in my Malifaux bayou.